Tortoises ( /ˈtɔːr.təs.ɪz/) are reptile species of the family Testudinidae of the order Testudines (the turtles). They are particularly distinguished from turtles by being land-dwelling, while many (though not all) turtle species are at least partly aquatic. 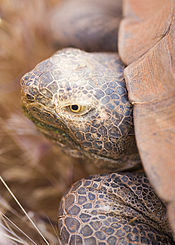 However, like turtles, tortoises have a shell to protect from predation and other threats. The shell in tortoises is generally hard, and like other members of the suborder Cryptodira, they retract their necks and heads directly backwards into the shell to protect them. Tortoises are unique among vertebrates in that the pectoral and pelvic girdles are inside the ribcage rather than outside. 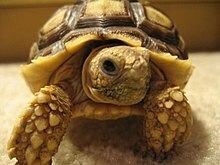 Tortoises can vary in dimension from a few centimeters to two meters. They are usually diurnal animals with tendencies to be crepuscular depending on the ambient temperatures. They are generally reclusive animals. Tortoises are the longest living land animal in the world, although the longest living species of tortoise is a matter of debate. 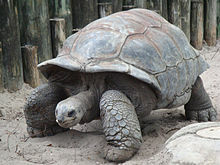 Galápagos tortoises are noted to live over 150 years, but an Aldabra giant tortoise named Adwaita may have been the longest living at an estimated 255 years. In general, most tortoise species can live 80–150 years. Most species of tortoises lay small clutch sizes, seldom exceeding 20 eggs, and many species have clutch sizes of only 1–2 eggs. Incubation is characteristically long in most species, the average incubation period are between 100 and 160 days. Egg-laying typically occurs at night, after which the mother tortoise covers her clutch with sand, soil, and organic material. The eggs are left unattended, and depending on the species, take from 60 to 120 days to incubate. The size of the egg depends on the size of the mother and can be estimated by examining the width of the cloacal opening between the carapace and plastron. The plastron of a female tortoise often has a noticeable V-shaped notch below the tail which facilitates passing the eggs. Upon completion of the incubation period, a fully formed hatchling uses an egg tooth to break out of its shell. It digs to the surface of the nest and begins a life of survival on its own. They are hatched with an embryonic egg sac which serves as a source of nutrition for the first three to seven days until they have the strength and mobility to find food. Juvenile tortoises often require a different balance of nutrients than adults, so may eat foods which a more mature tortoise would not. For example, the young of a strictly herbivorous species commonly will consume worms or insect larvae for additional protein. Harriet was a resident at the Australia Zoo in Queensland from 1987 to her death in 2006; she was believed to have been brought to England by Charles Darwin aboard the Beagle and then on to Australia by John Clements Wickham. Harriet died on June 23, 2006, just shy of her 176th birthday. Many species of tortoises are sexually dimorphic, though the differences between males and females vary from species to species. In some species, males have a longer, more protruding neck plate than their female counterparts, while in others, the claws are longer on the females. A skeleton of Aldabra giant tortoise found in Cousin Island ( Seychelles). In Hinduism, Kurma ( Sanskrit: कुर्म) was the second Avatar of Vishnu. Like the Matsya Avatara, Kurma also belongs to the Satya Yuga. 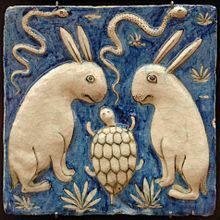 Vishnu took the form of a half-man, half-tortoise, the lower half being a tortoise. He is normally shown as having four arms. He sat on the bottom of the ocean after the Great Flood. A mountain was placed on his back by the other gods so they could churn the sea and find the ancient treasures of the Vedic peoples. ^ Moon, J. C.; McCoy, E. D.; Mushinsky, H. R.; Karl, S. A. (2006). 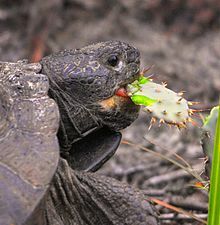 "Multiple Paternity and Breeding System in the Gopher Tortoise, Gopherus polyphemus". Journal of Heredity. 97 (2): 150–157. doi: 10.1093/jhered/esj017. PMID 16489146. ^ Turtle Taxonomy Working Group: van Dijk, P.P., Iverson, J.B., Rhodin, A.G.J., Shaffer, H.B., and Bour, R. (2014). Turtles of the World, 7th edition: annotated checklist of taxonomy, synonymy, distribution with maps, and conservation status. In: Rhodin, A.G.J., Pritchard, P.C.H., van Dijk, P.P., Saumure, R.A., Buhlmann, K.A., Iverson, J.B., and Mittermeier, R.A. (Eds.). Conservation Biology of Freshwater Turtles and Tortoises: A Compilation Project of the IUCN/SSC Tortoise and Freshwater Turtle Specialist Group. Chelonian Research Monographs 5(7):000.329–479 doi: 10.3854/crm.5.000.checklist.v7.2014. ^ Austin, J. J.; Nicholas Arnold, E. (2001). "Ancient mitochondrial DNA and morphology elucidate an extinct island radiation of Indian Ocean giant tortoises (Cylindraspis)". Proceedings of the Royal Society B: Biological Sciences. 268 (1485): 2515–23. doi: 10.1098/rspb.2001.1825. PMC 1088909. PMID 11749704. ^ Bell, T. (1827). "XVI. On two new Genera of Land Tortoises" (PDF). Transactions of the Linnean Society of London. 15 (2): 392–401. doi: 10.1111/j.1095-8339.1826.tb00122.x. Antoinette C. van der Kuyl; Donato L. Ph. Ballasina; John T. Dekker; Jolanda Maas; Ronald E. Willemsen; Jaap Goudsmit (February 2002). "Phylogenetic Relationships among the Species of the Genus Testudo (Testudines: Testudinidae) Inferred from Mitochondrial 12S rRNA Gene Sequences". Molecular Phylogenetics and Evolution. 22 (2): 174–183. doi: 10.1006/mpev.2001.1052. ISSN 1055-7903. PMID 11820839.